How do you love pasta? Let us count the ways. 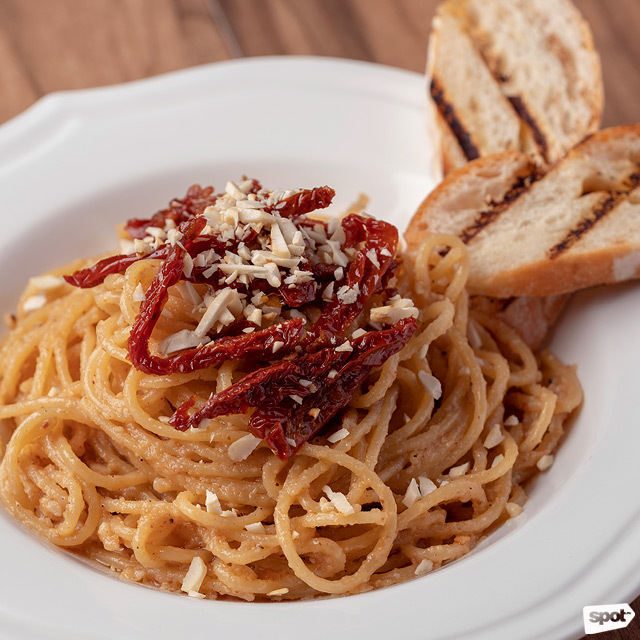 (SPOT.ph) Whether it’s cooked in a traditional tangy tomato-based sauce, a rich and creamy one, or something out-of-the-ordinary like salted egg, a pasta dish is just as comforting as the other. Good thing you don’t have to look far to find something good—it’s practically everywhere! Today, we’re zooming in on Quezon City, which is full of amazing food finds. 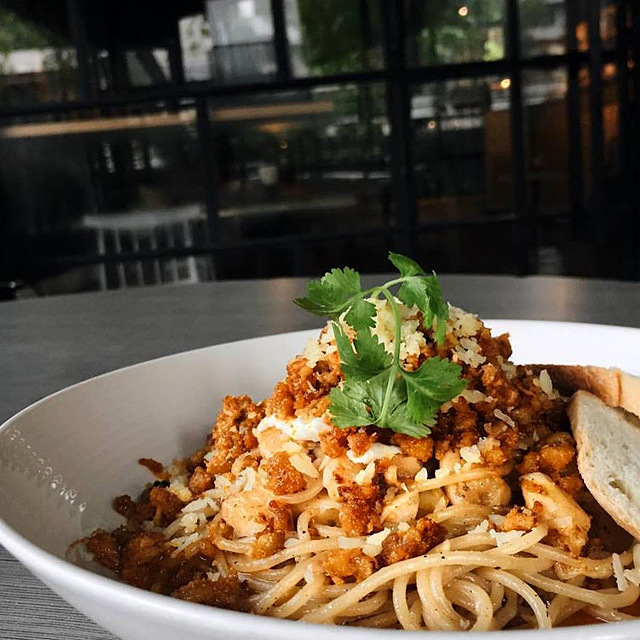 And because pasta dishes are plentiful in the city, we’re helping you identify the best places for noodles for some serious carbo-loading. Take your palate on a food trip without traveling thousands of miles—Vanderlust is a trendy bistro that highlights French, German, and Spanish cuisines. You’ll be pleasantly surprised at their under-the-radar desserts and mains that won’t break the bank, but their pastas are a different story on their own. 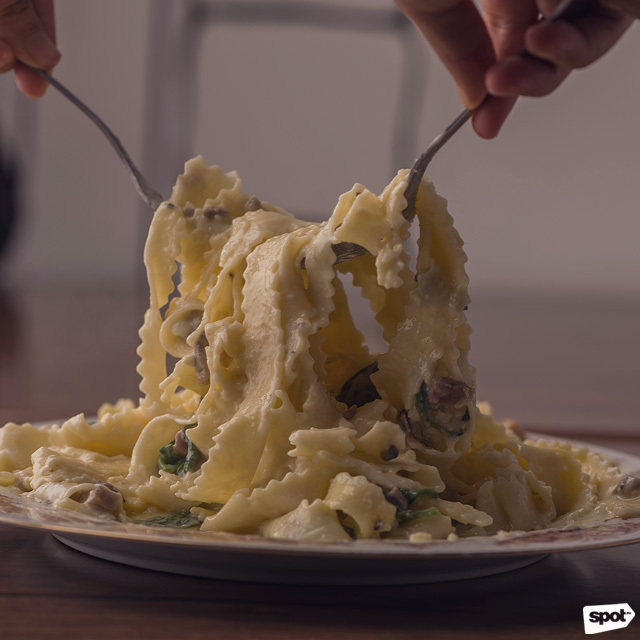 It’ll be difficult to find Cacio E Pepe (P248) as good as is this in QC, highlighting the contrasting flavors of cheese and pepper all in a single dish. Another standout is the Pesto Bianco (P288), with sun-dried tomatoes to give it that distinctive tang, nuts for crunch, and a squeeze of lemon for a refreshing acidity. Did we mention that their noodles are perfectly al dente? Vanderlust is at 100 Scout de Guia corner Tomas Morato Avenue, Sacred Heart, Quezon City. 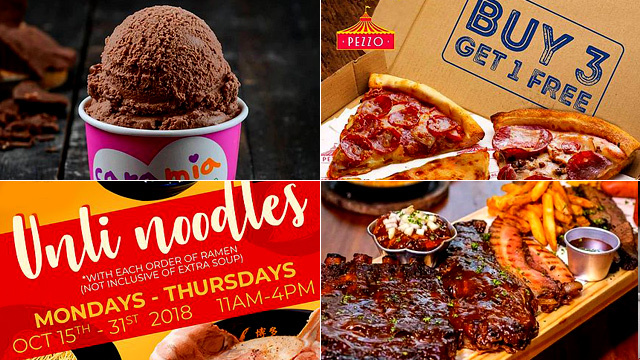 There’s a reason why foodies love Quezon City—it’s filled with affordable restaurants! Many would say that you won’t find a more genuine (not to mention wallet-friendly) Italian restaurant in Teachers Village. With whole pizza pies that you can get for less than P300 and pasta plates that don’t go beyond P200, we’ll let you be the judge. 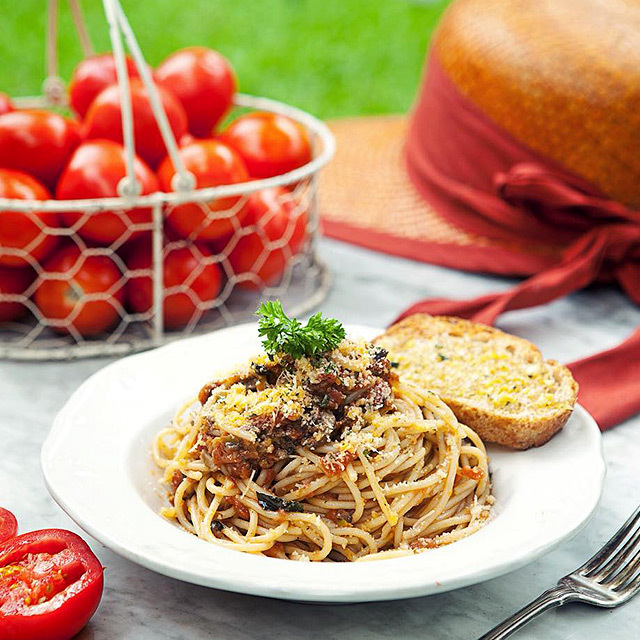 The Capellini alla Putanesca (P170) is the restaurant’s version of a simple Italian recipe, with delicate angel-hair pasta cooked with tangy tomatoes, capers, anchovies, and olives. 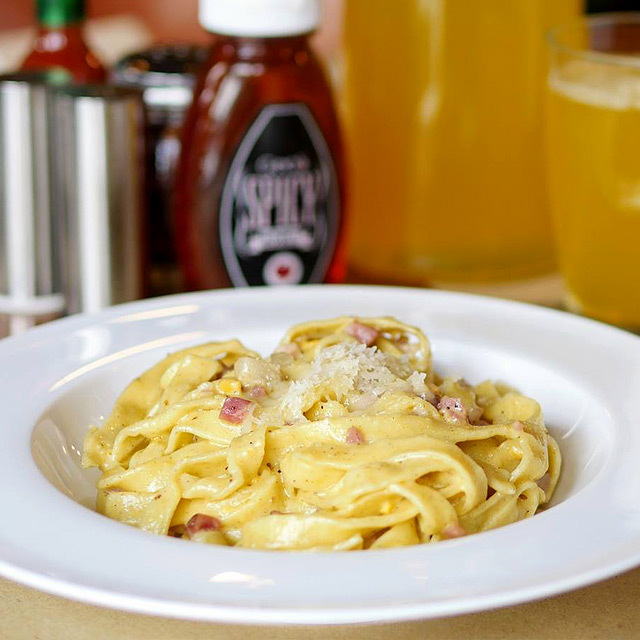 Meanwhile, the classic Spaghetti Carbonara (P180) feels like a warm and familiar hug with its comforting creamy sauce made with bacon and egg. Don’t forget to ask for extra parm. Friuli Trattoria has branches at 79-A Maginhawa Street, Teachers Village, Quezon City; and UP Town Center, Diliman, Quezon City. Roast chicken might be the star of the show at Salta! Italian Rotisserie Chicken Bar, but they’ve also got some pasta specialties that can steal the spotlight. The restaurant is from the same makers of bazaar pop-up Pappare Ristoranti, which offers unique pasta dishes in cool cone-shaped containers, after all. Don’t leave without trying their famous CRABonara (P250), an indulgent combo of crab meat, crab fat, bacon, and a perfectly poached egg. 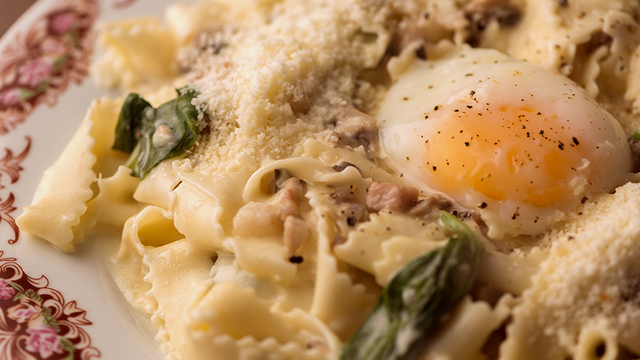 A worthwhile variation of it is the Spinach Tartufina Carbonara (P205), which also has bacon and runny egg, plus the addition of veggies—to lessen the guilt, perhaps—and fragrant truffle oil to make the meal even more indulgent. Pair these with wine or even their homemade sangria, served in big carafes for your drinking pleasure. Salta! Italian Rotisserie Chicken Bar is at 38 Mayaman Street, Diliman, Quezon City. With their appetizing brick-oven pizzas and homemade cheeses (hello, fresh burrata! ), it’s highly likely that you’re bound to overlook the pasta offerings at Gino’s Brick Oven Pizza. To get a taste of their freshly made noodles (made with organic eggs, no less! ), order a plate of Pesto (P245), made with fazzoletti (a.k.a handkerchief pasta) basil, arugula, pine nuts, kesong puti, ricotta, and Parmigiano Reggiano. The Salted Egg (P225), on the other hand, is a heart-stopping mix of heavy cream, salted egg, bacon, and cheese—it might sound simple but its savory flavor will surprise you. Gino’s Brick Oven Pizza is at 319 Katipunan Avenue, Loyola Heights, Quezon City. Café Mary Grace is practically synonymous to heavenly cheese rolls and ensaymada, but should you linger and eat, you’ll discover that this full-service restaurant has quite a list of delicious offerings, too. Case in point: Pasta. 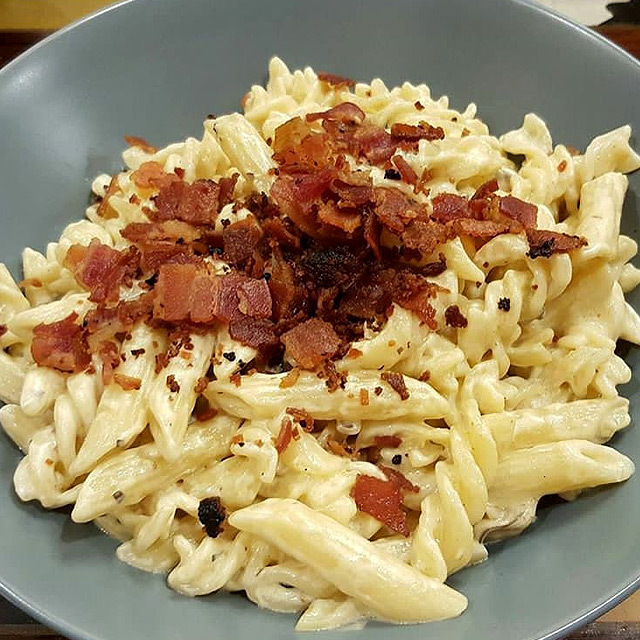 Check out any of their generously portioned pasta dishes, all made with al-dente noodles, real stock, grated Edam cheese, and EVOO, served with toasted garlic bread on the side. For something light, there’s the oil-based Seafood (P350) pasta, which comes with a medley of clams, mussels, prawns, squid, and cream dory in a light and herby sauce. If something rich and creamy is more your thing, you’ll enjoy the umami Mushroom Cream (P378) pasta, with fettuccine, shiitake mushrooms, and truffle oil. See a list of Café Mary Grace branches in Quezon City. 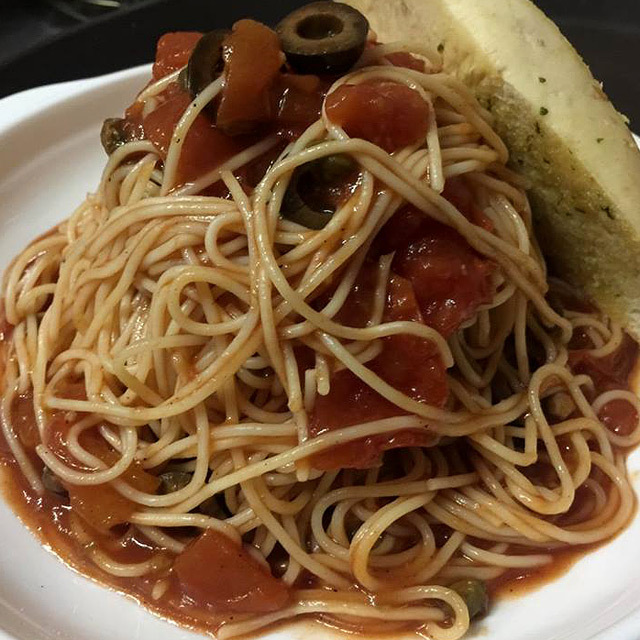 If you’re familiar with Mama Lou’s Italian Kitchen, then there’s a big chance you’ll like its sister restaurant, Nonna’s Pasta & Pizzeria. 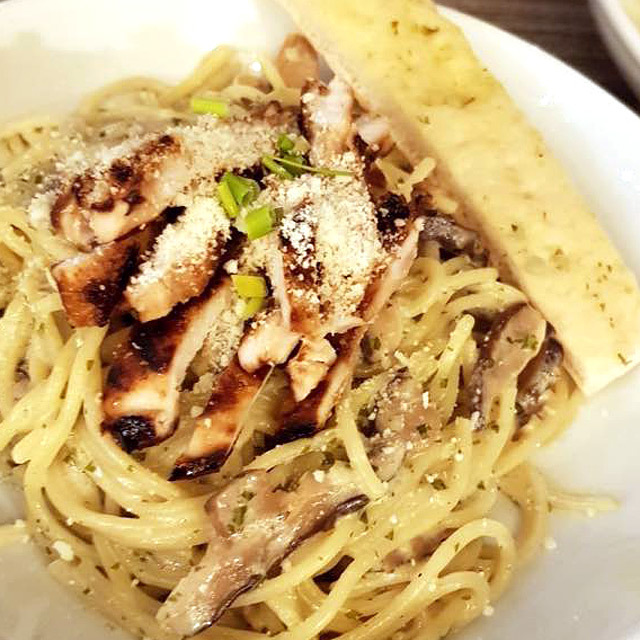 Like Mama Lou’s, the latter has a wide assortment of pasta dishes—pomodoro, olio, ravioli, you name it. 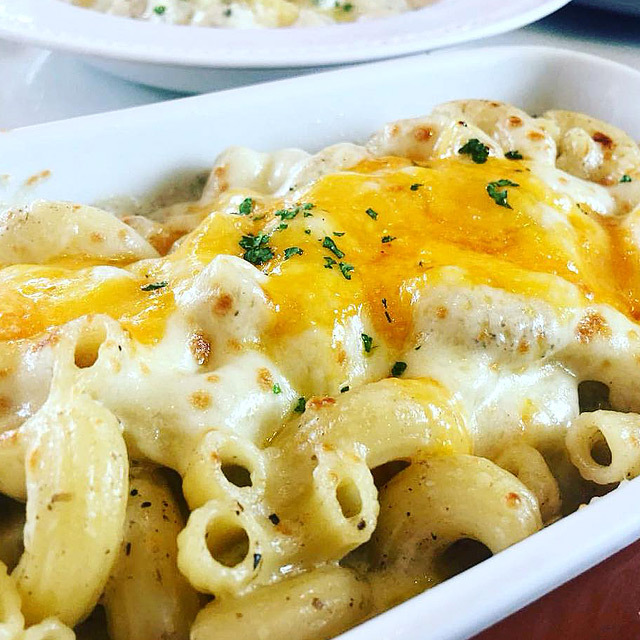 Best to focus on pasta plates you can’t cook at home without breaking a sweat: Give the Jalapeño Mac & Cheese (P285) a chance if you don’t mind a little heat and spice, or try the cheesy Classic Lasagna (P325), with rich meat sauce, parmesan, and gooey mozzarella. Whatever you’re in the mood for, you’re likely to find something here. Nonna’s Pasta & Pizzeria is at 3/F Robinsons Galleria, Ortigas, Quezon City. What adds charm to this hidden gem in Tomas Morato is the quirky interiors that displays mismatched furniture, colorful wall art, and one-of-a-kind knickknacks. Their menu offers a myriad of international dishes that would satisfy discerning diners, too—from paella and grilled meats, to the ever-present pasta. Ever wonder why their Truffle Pasta (P325/solo, P515/family) is still being talked about until today? Clue: There’s real white truffle and Portobello mushroom in its sauce! Another hit is the Spicy Shrimp Pasta (P295/solo, P415/family), which comes with freshly grilled garlic and shrimp drizzled with a lot of olive oil. The Frazzled Cook is at 78 Scout Gandia Street, Laging Handa, Quezon City. From the restaurant’s exposed ceiling beams and hanging Edison bulbs, to the interesting wall décor with a big chalkboard at the center, you’ll get that modern yet industrial feel at Fat Russel’s Kitchen. 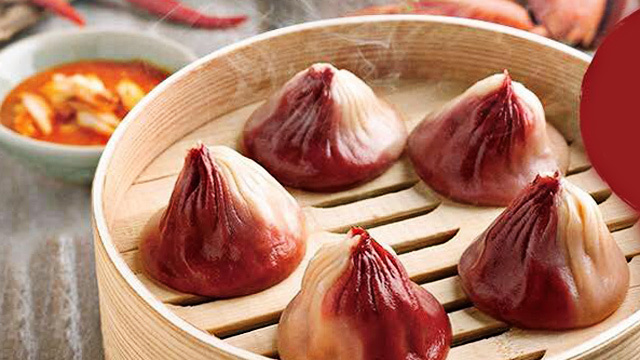 Their dishes may be a hodgepodge of cuisines but they have a common comfort factor that diners look for. Go for the Seafood Black Pasta (P220), a show-stopping, conversation-starter with black-ink sauce and an assortment of seafood. Picture a pile of thin strands of ebony noodles that’s topped with selected seafood like mussels and squid. You can’t help but take a snap before digging into it! Another drool-worthy dish is the Salted Egg Pasta with Shrimp (P220)—perfect for those who are still into the salted egg craze. Fat Russel’s Kitchen is at 21 Scout Castor Street, Laging Handa, Quezon City. You’ll feel a sense of hominess, if not for their sleek interiors, at this ancestral house-turned-restaurant. There’s a black-and-white theme going on at Lola Café—the perfect backdrop to enjoy their colorful dishes. Enjoy Filipino-inspired pasta like the Spicy Tinapa (P265), where you’ll have smoked bangus cooked with tomatoes and herbs over pasta, instead of the traditional white rice. You can also try another local route to keep your excitement going: Their Crispy Pancit Lechon (P280) has fried noodles, succulent lechon kawali, and shrimp. It's not the most traditional, but the fusion of Italian and Filipino flavors are worth trying. This might be a sign to finally set that date you’ve been planning these past few weeks. Expect to be impressed at La Spezia, a beautiful Italian restaurant in Quezon City that’s named after a coastal town in Italy. Reading the menu, your eyes might probably lead you to ordering steak (which isn’t really a problem), but make sure to try their excellent pasta dishes. The Pasta Al Tartufo (P330/430), tastes as good as it sounds like, with real black truffles, cream, and almonds for that extra earthy punch. 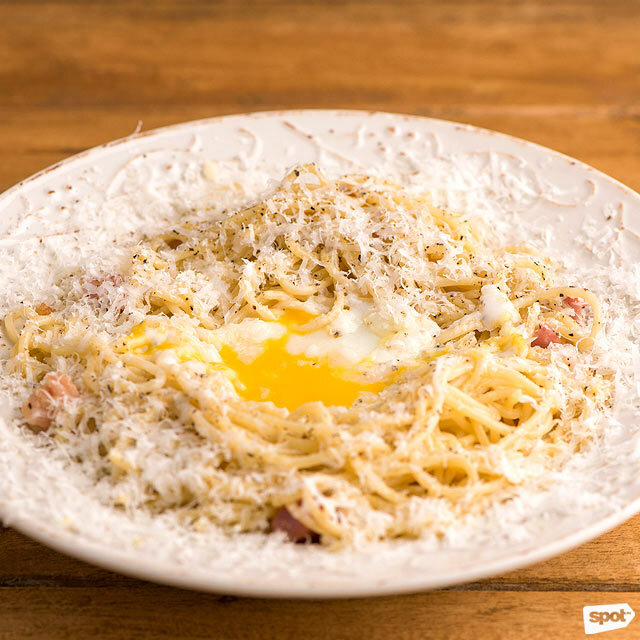 Their Spaghetti Alla Carbonara (P440) is arguably one of the best in the Metro, too—the sous-vide egg, pancetta, and Parmigiano Reggiano seal the deal. Don’t be surprised if you get a second date after dining here! La Spezia is at 90 Scout Lazcano Street, Laging Handa, Quezon City.